Hi, I hope you are loving the Joseph’s Coat technique I shared in the last post! I sure am! I have another version to share with you today. 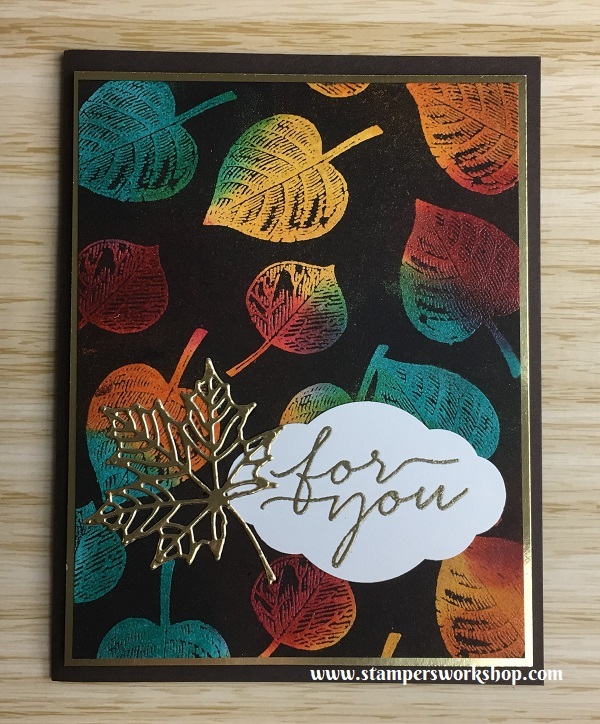 I’m using the Colorful Season stamp set to showcase a winter card. I followed the steps outlined in the last post but this time I’ve gone with a blue/purple colour scheme. Isn’t this such a fun technique? I’m addicted to making cards this way! 🙂 I think you could also switch up this card design a little and it would make a fantastic Christmas card! 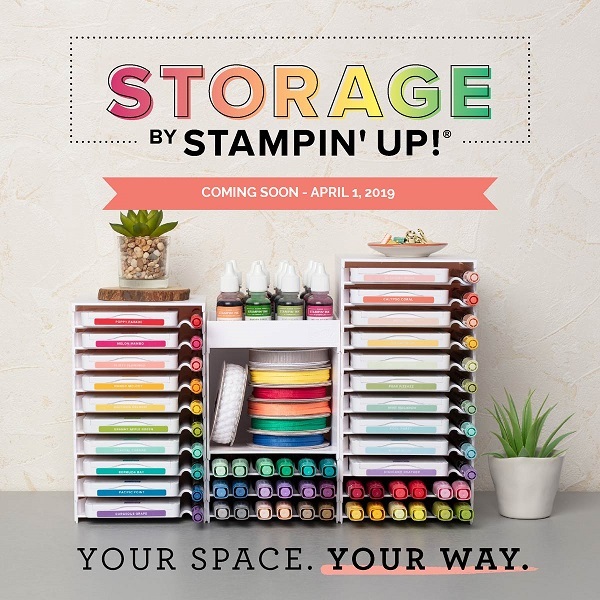 To start with grab a sheet of Whisper White cardstock. I usually start with a piece about 4.25″ x 5.5″. With your sponges/sponge daubers, apply whatever colours you like. I used Daffodil Delight and Pumpkin Pie on all three cards. I combined them with Bermuda Bay and Cherry Cobbler for the first card. For the last two cards, I used Real Red and Old Olive. The great thing is that you don’t have to be too careful with your blending at that this stage. Make sure, however, that you do cover the entire base of the card with ink. The next step is SUPER important! Either put the inked panel aside to thoroughly dry or use the heat tool. You don’t want to proceed with this technique until the panel is completely dry. Once dry, use your embossing buddy to remove any static as we don’t want the embossing powder to stick in the wrong places. 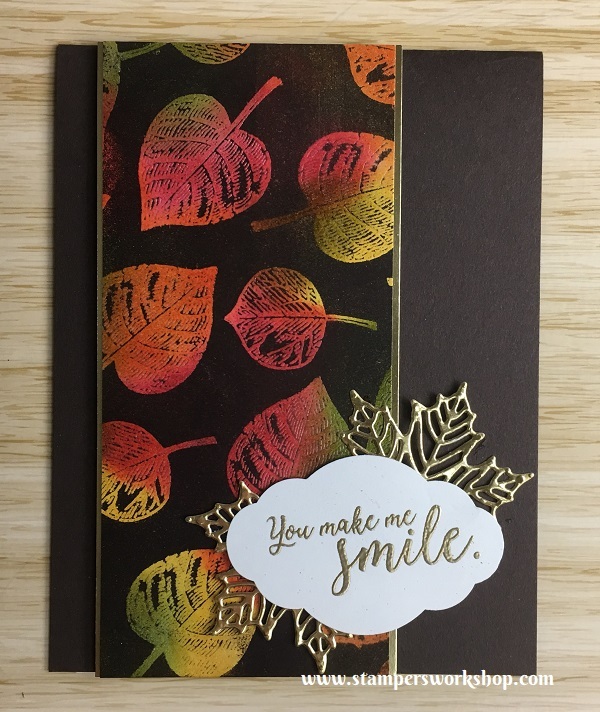 Take your stamps – I’m using the Vintage Leaves stamp set – and with Versamark ink, stamp the entire background. Once finished, add clear embossing powder. 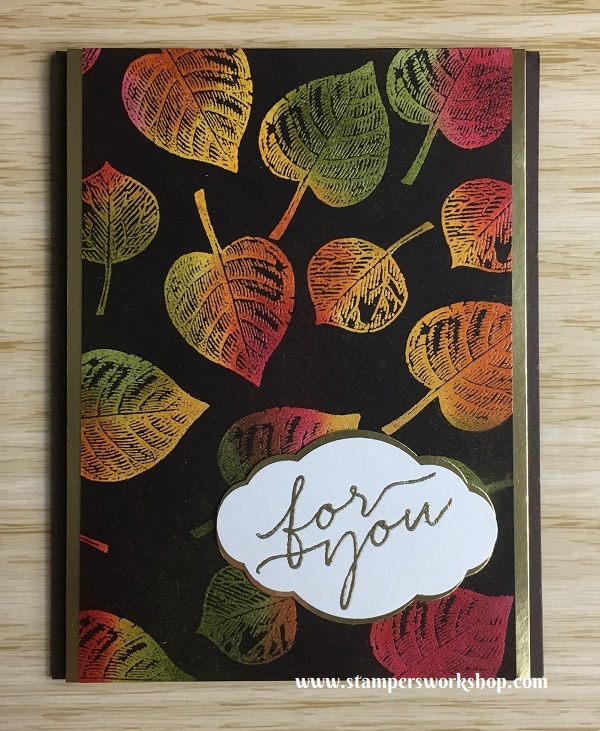 (If you think your Versamark ink will dry too quickly you can do this in stages – stamp a few leaves, apply embossing powder, and repeat). 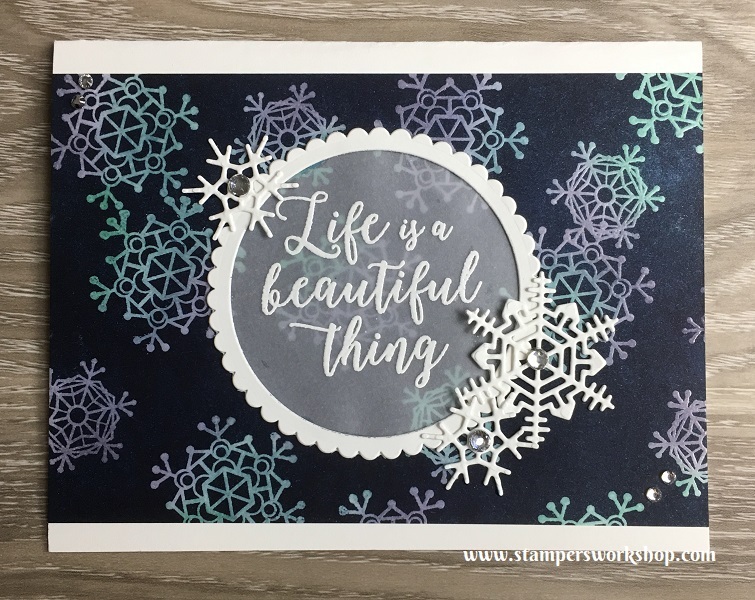 Use your heat tool to melt the embossing powder. The next step might be a bit scary but I assure you it is TOTALLY worth it. Take a very dark ink pad such as Tuxedo Black Memento Ink or, in this case, Early Espresso (I thought it would tie in with my autumnal look) and swipe it all over the background you just created. YES! Do it! It will be worth it. Once you have covered the entire panel, take a clean paper towel or a cloth and gently buff over the embossed images and watch them shine! How good does it look! Now you know the process, let’s have a look at the cards I created using the fabulous Joseph’s Coat technique. I thought the Bermuda Bay might have been a little bright for autumn leaves so decided to switch it out for Old Olive. Isn’t this a fabulous technique? I hope you will give it a try! If you need any more information about this technique, please let me know.